The Ergosum consortium, comprising France’s leading retailers, store card providers and mobile operators, has published detailed specifications and use cases for the implementation of NFC payments, coupon redemption and loyalty points management at the point of sale, ahead of planned large scale consumer testing. The Ergosum consortium of France’s leading retailers and mobile operators has published its specifications for the use of NFC at the point-of-sale. The members of Ergosum include many of France’s largest supermarkets and other major retail chains as well as France’s mobile operators and store card providers — Auchan, Banque Accord, Bouygues Telecom, Carrefour, Castorama, Cofidis, E Leclerc, Finaref, Fnac, Groupe Casino, Groupement des Mousquetaires, Jules, Kinepolis Cinémas, LaSer-Cofinoga, Leroy Merlin, Printemps, Orange, SFR and Système-U — and, last year, announced plans for a large-scale test of NFC in the retail environment. As well as detailed specifications, which can be downloaded (in French only) from Ergosum’s website, the consortium has also created two Flash animations that show in detail how it sees NFC services being delivered in a retail environment. 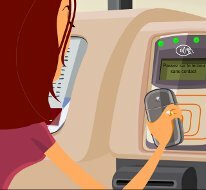 The first animation shows how an NFC phone can be used to make payment, redeem coupons and collect loyalty points at a self-checkout in a large store. In the scenario, the consumer arrives at the checkout with four coupons and their store loyalty card loaded onto their mobile phone. They also have their bank card stored in the phone and set as their default mode of payment. In the course of checking out, they use three of the discount coupons, use their bank card to make payment and receive a new coupon plus five loyalty points, all stored on their mobile phone. On arrival at the checkout, the customer checks her mobile phone to see that the card she wants to use for payment is set as the default and to view her coupons and current loyalty points balance. She then self scans her purchases and, when finished, she hits the ‘sub-total’ button and is prompted to touch her phone to an NFC reader built into the checkout so that the coupons stored in her phone can be deducted from her bill. Any coupons stored in her phone that are redeemable against her purchases are then automatically deducted and she is presented with a final total. She is then prompted to touch her phone to the reader again to make payment. At this point, the bill total is transmitted to her phone so that she can enter her PIN on the handset. Once she has done that, she touches the phone to the screen again to complete the payment. A receipt is then printed, showing any new coupons and loyalty points she has gained, and her new coupons and points total are also available for her to view on her phone. The second animation shows how an NFC phone is used at a manned checkout in a DIY store. Here, the scenario is the same as with the self-checkout example, but the cashier is also prompted to inform her that she is entitled to an additional 5% discount if she chooses to pay with her store card.